When Ancito Etienne was 12, he decided to plan his funeral. He had cancer. “I knew that there was no way I was going to receive treatment in Haiti, and instead of just seeing my parents be desperate and crying all the time, it would be better to spend the few days I had, be happy, and plan a funeral,” he said in a recent interview. Thanks to the global nonprofit Partners in Health bringing him to the United States for cancer treatment, that funeral never happened. Almost a decade later, Ancito now is planning for graduation and life after University of Lynchburg. His long term goal? Ensure that future 12-year-olds in Haiti have better options than he did. This goal began when Ancito attended school in the U.S. during his cancer recovery. He learned about education as a human right, a foreign concept to his home country. 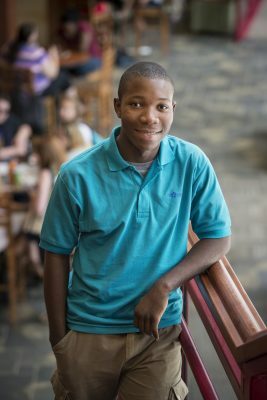 When he returned to Haiti, he started an initiative with his friends to help children attend school and dream of a better future for themselves. He also served as a translator for English-speaking doctors in the aftermath of a major earthquake in 2010. Twice he came back to the U.S. for summer programs on leadership and health. 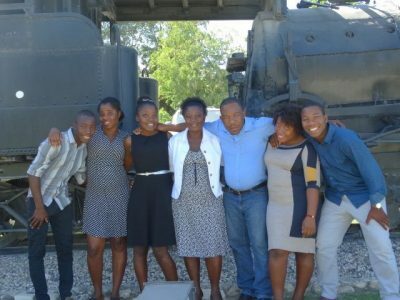 Ancito with his family in Haiti. He started college on the pre-med track, hoping to go back to Haiti as a doctor. But as he took more interdisciplinary classes in the Westover Honors Program, he realized that his home country needed more than just one more medical professional. “As a doctor I might be able to save lives, but Haiti needs much more,” he said. “In order to solve the health issue, it would not only require me to save just one person at a time, it would require a macro-change” — including large-scale changes such as affordable health insurance, clean water, education, and a more effective application of foreign aid. In addition to working on research with faculty, Ancito spent last summer crunching numbers for Mercy Corps, an organization that uses data to advocate for reform in food aid and peace-building activities. Ancito also joined the Bonner Leader program, which challenges student leaders to complete 600 community service hours in two years while also participating in eye-opening experiences learning about other cultures and societal issues. Ancito enjoyed getting to work alongside other students who shared his passion for service. “This was one of the best decisions I made here,” he said. Anne Gibbons, associate chaplain and director of the Bonner Leader program, was delighted when Ancito brought his international experience and his passion for service to the program. Although he was a self-driven leader already, she has watched him develop an ability to serve as part of a community. “He’s learned the importance of connecting with your peers, building community, finding who your allies are, and working together in collaboration,” she said. 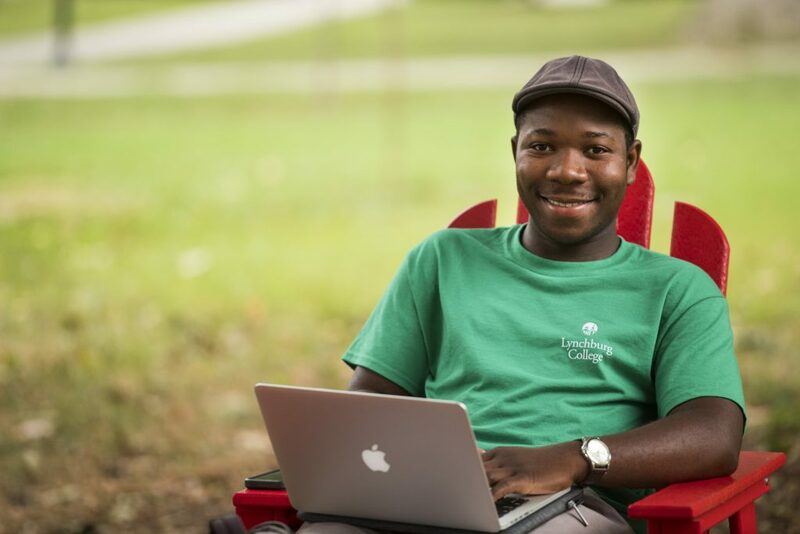 When it came time to write his honors thesis, Ancito was curious about why foreign aid had not already solved the problems he hopes to alleviate in Haiti. He dove deep into facts and figures about international aid in Haiti and several other countries in the Caribbean and Latin America. The results show that foreign aid has had little impact on GDP per capita or life expectancy, probably because money from foreign aid is used more for a quick fix than for long-term investments in infrastructure and education. “We have to focus on leveraging foreign aid more purposefully and creatively,” he said. His senior paper, which won the Oral Presentation award for the School of Business and Economics in the Student Scholar Showcase this spring, lays the groundwork for his passion in life. After he graduates from Lynchburg on Saturday, Ancito plans to work for one year and then earn a PhD program in development economics. Then he wants to return home and help the Haitian government. “We may still rely on foreign aid for a very long time, but we have to use it better,” he said. Ancito has said that Lynchburg’s status as one of the “Colleges that Change Lives” is about more than shaping the lives of graduates; it has a lot to do with the lives those graduates change. Someday, he hopes to tell the story about how his college education set the stage for better education, more accessible health care, and cleaner water in Haiti.